Looking thoroughly at home on the Quin’s warm ecru walls are Aarons’ expansive shots of plush, mid-century playgrounds of privilege — Beverly Hills, Palm Springs, Monaco, Gstaad, Bermuda and Mustique, to name a few — and their camera-ready inhabitants. 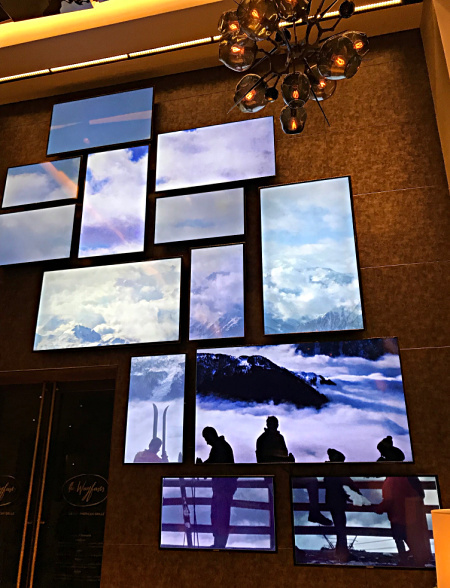 The images spill onto the Quin’s towering wall of flat-panel screens where they dance before your eyes — a changing feast of swimming pools, ski resorts, idyllic beaches and turquoise oceans. In a pre-Instagram world, Aarons’ photos splashed across the pages of glossy magazines like Town & Country, Holiday, Harper’s Bazaar and LIFE, where he opened the magazine’s postwar Rome bureau. Though undeniably commercial, an attribute that may account from their absence from major museum collections, Aarons’ output was superb photojournalism. Once called “an anthropologist with a camera,” he meticulously documented an era. His beautiful people appear in natural surroundings with little makeup and no artificial light. Some credit Aarons with raising the environmental portrait to the level of art. The Quin’s well-chosen images make a good argument for that. Photographed almost exclusively out of doors, they display a day-in-the life quality. Against artfully composed backdrops of snow-blanketed mountains, sumptuous pool decks and private beaches, Aaron’s subjects go about their business, be it sunbathing, skiing, sipping drinks or socializing, unaware of or unfazed by the camera. 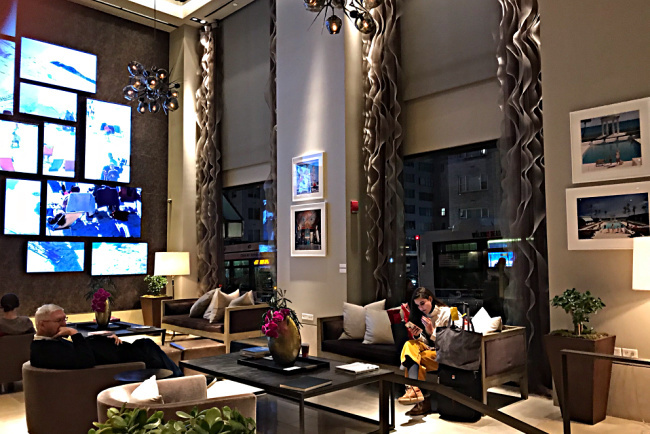 The resulting images have more in common with a National Geographic shot of lions prowling the Duba Plains than a graciously lighted studio portrait of the Duchess of Cambridge. 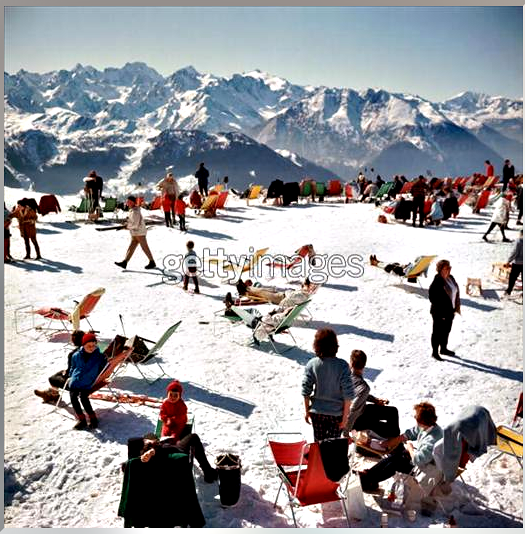 Consider “Verbier Vacation” (1964), a sea of well-heeled holiday makers lounging in densely packed deck chairs on a snowy peak and gazing out at snow-covered Alps. It’s an upscale cousin to those vintage black-and-white shots of wall-to-wall July Fourth sunbathers on Jone Beach. If you’re an Alfred Hitchcock fan, it’s not hard to picture Aarons as the model for L.B. Jeffries, the dashing photographer — and preternaturally watchful neighbor — in Rear Window played by James Stewart. Whether or not that’s true, Aarons’ apartment was almost surely the inspiration for Jeffries’ unpretentious bachelor pad, cluttered with camera equipment and stack of LIFE magazine. Aarons, of course, moved on, assiduously avoiding war zones. Eventually settling in Katonah, NY, he wintered in Gstaad and Palm Beach, summered on the French and Italian Riviera and, prolific to the end, published five books of his photographs. He died in 2006. “The Slim Aarons Exhibition” presented by Quin Arts and Getty Images is on view through the end of the year.